The photographer's shot made front page of the newspaper because it looked so out of season to ski in August at Snowbird. 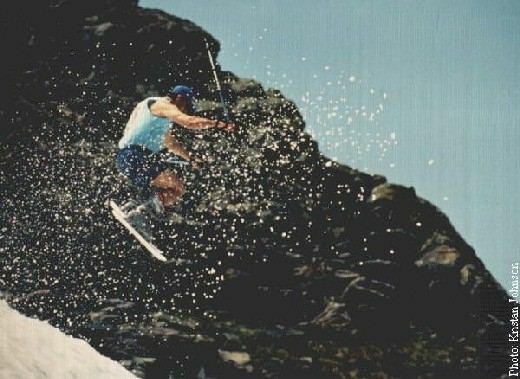 Last May '98 in "Rock Garden" at Snowbird--31" in 24 hours! Just outside this Oregon ski area are deep crevasses in the permanent glacier. They are beautiful formations to look at, but they kill out-of-bounds skiers and hikers almost every year that I've been there. I have been skiing the volcano for the last 9 seasons. Plenty of fun inbounds stuff to ski in September at Mt. Hood, oregon. (Answer from Ski Streak Home Page Trivia Question: The answer is Mammoth, which can move over 50,000 skiers per hour! Next Trivia: Which ski resort has the highest chairlift (double, triple, or quad) in the WORLD?